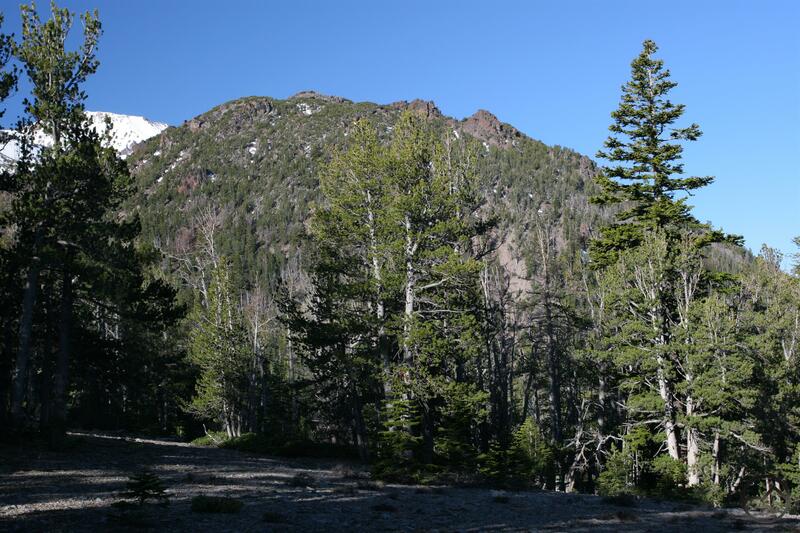 Exploring the isolated northern flanks of Mount Shasta, the North Gate Trail climbs to treeline and offers great views of Mount Shasta and areas to the north, as well as the chance for further exploration. Mount Shasta from the summit of North Gate Plug 8,852. The North Gate Trail accesses Mount Shasta’s north side. The trail takes its name from a series of volcanic plugs that the trail traverses and passes beneath. While the path is used primarily to gain access to the routes that climb the volcano’s northern slopes, it is also a good option for those who wish to just hike on the flanks of the great mountain. Generally, the routes accessed via the North Gate Trail include the Whitney Glacier, the Whitney- Bolam Ridge, the Bolam Glacier, and Hotlum-Bolam Ridge routes. (It should be noted that one can access the Whitney routes via the Whitney Falls Trail, but this route has been wiped out be repeated glacial outbursts and is no longer maintained. In addition, it involves more elevation gain than the North Gate Trail.) There are no routes west of the Whitney Glacier (until one reaches the south side of Shastina, an area accessed from the south side of Mount Shasta). The routes to the summit beyond the Hotlum-Bolam Ridge are accessed via the Brewer Creek Trail. 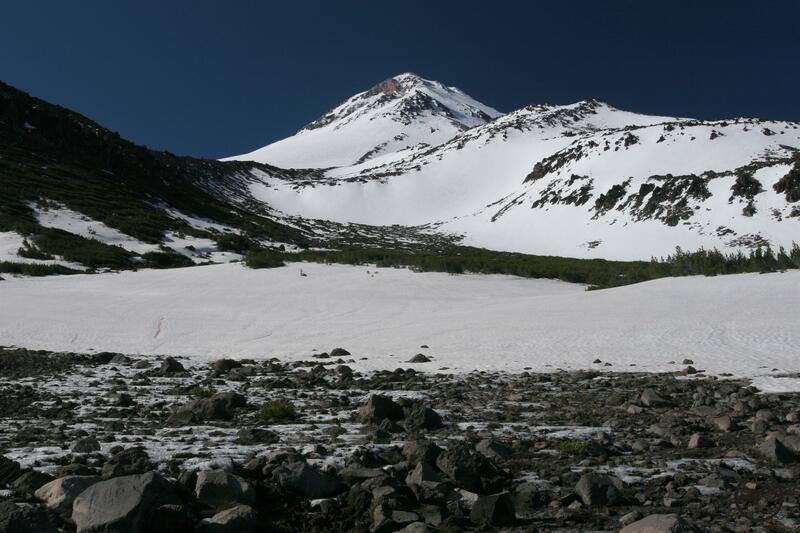 Consequently, any north side attempt at Mount Shasta’s summit is reached via the North Gate Trail, which means that this can be a heavily used path at times. 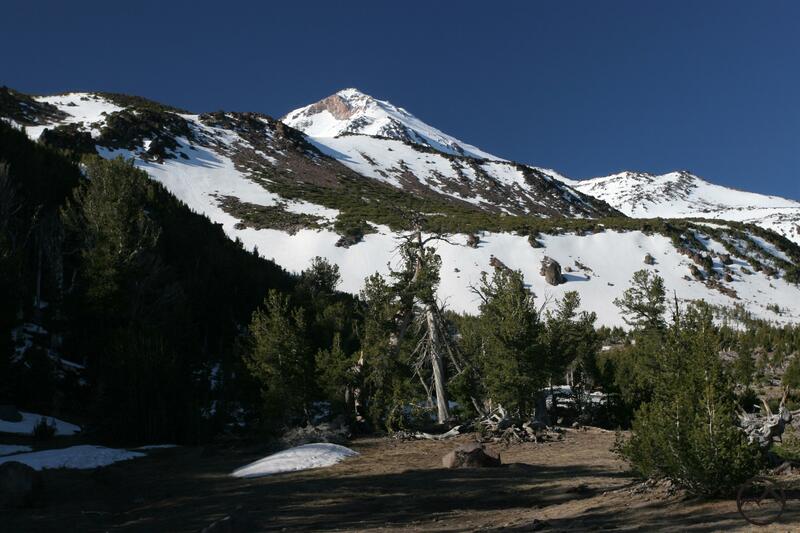 For those out for a simple hike, the trail is a great opportunity to experience Mount Shasta’s northern perspective, as well as take in vistas of a hefty slice of the northernmost part of the state. Although the official trail does fade away as one climbs in elevation, those looking for a concrete destination can either climb North Gate Plug 8,852 or attempt a bushwhack to Bolam Creek’s canyon in search of elusive Coquette Falls. Nearing the top of the long switchback. The North Gate Trail sets off to the southeast at a very moderate grade. The trail passes through a fairly open red fir forest. In fairly short order, the path crosses a dry gulch. The original North Gate trail was route directly up this drainage to the North Gate area. This was eventually abandoned due to the trail being perpetually washed out by the occasional flash flood that flowed down the gulch. Despite its abandonment, a faint use trail continues to lead up the gulch. For those who want to reach the climbing routes in haste, this is the way to go. For those who want a more leisurely climb, continue on the main trail. Rather than climbing steeply up the gulch, the trail laterals to the south east, passing beyond the gulch. It switchbacks several times, always maintaining a very reasonable gradient. After 0.75 miles, the trail turns the south, continuing for another 0.25 miles. Here the trail makes a sharp turn to the west, eventually recrossing the dry gulch. From the trailhead to this point, the route has been in continual tree cover. Here though, the views open up a bit and one can observe the summits of the two lower North Gate Plugs. The trail makes one, long switchback, coming within close proximity of Plug 7,915. The first view of Mount Shasta from the North Gate Trail. Once on the top of the long, lazy switchback, the trail is actually on the crest of forested ridge. Views begin to open up more as one proceeds south. After nearly 0.5 miles, the trail again skirts the dry gulch, though the gulch is much wider and a bit harder to discern at the higher elevation. From here on the trees begin to thin and grow smaller as the trail advances toward timberline. 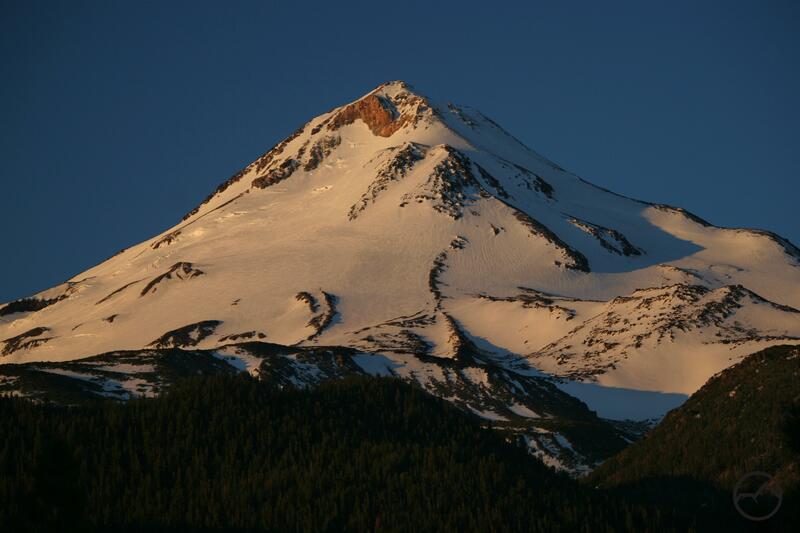 Views of Mount Shasta, with the striking Hotlum headwall come into view. The views to the north improve as one climbs, though, unfortunately, the Goosenest blocks out Mount McLoughlin. Eventually the scree covered domes of North Gate Plugs 8,852 and 8,798 become visible. The trail continues to the southwest as the area it traverses constricts and the walls of North Gate Plug 8,852 and the broad base of the Hotlum-Bolam Ridge become something of a chokepoint. The trail crosses a small creek originates in this area and flows to the north. The official trail begins to peter out here, as the trees continue to shrink and an epic view of Mount Shasta really opens up to the south. One presumes that this narrow point on the trail is the actual North Gate. This is because of its resemblance to the Gate, now referred to as South Gate, which is located on the south side of Mount Shasta, between Sargents Ridge and Red Butte. Looking north, up the route to the summit. 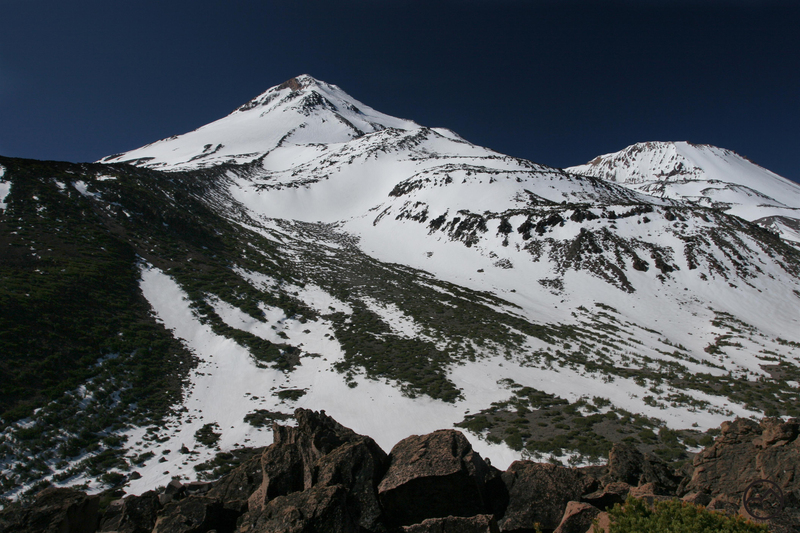 For those who are attempting to climb Mount Shasta, there are two ways to proceed. If one is attempting the Hotlum-Bolam Ridge or the Bolam Glacier, one continues up the valley toward the summit. The basecamp for this route is located at about 10,000 feet. The route to the Bolam Glacier departs from here. If one is attempting the Whitney Glacier or Whitney-Bolam Ridge routes, rather than climbing south toward the summit, proceed west, through the stunted white-bark pines. Traversing to the west from here will lead to the Bolam Glacier basecamp, another departure point for the Bolam Glacier, and ultimately leads to the Whitney Glacier basecamp. Looking north, from North Gate Plug 8,852. If one is simply hiking, rather than attempting to climb Mount Shasta, the summit of North Gate Plug 8,852 is a great destination. To climb the plug, continue west from the narrowest point of the North Gate, angling toward the base of the plug. There is a broad, talus-filled chute down the south face of the plug. While this looks like a quick way to the top, the talus is very loose, as much of it has not found its angle of repose. Rather than attempting this, continue west just a little further, to a makeshift campsite surrounded by white bark pines. Here there is a large rib of solid rock that leads up the plug. Climb up the large rocks on the left side of this rib. The rock along here is larger and more stable and the rib is solid and provides a sound base for climbing up to the summit. 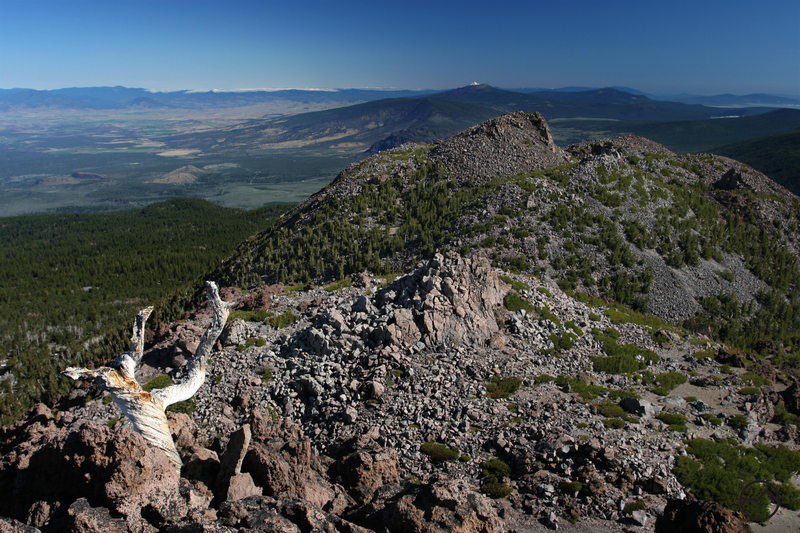 From the top, the northern Eddies, the Scott Mountains, the Russian Mountains, the Marble Mountains, the Red Buttes, Siskiyous and southern Oregon Cascades are all visible. Mount McLoughlin is finally visible for the first time, situated right above the Goosenest. 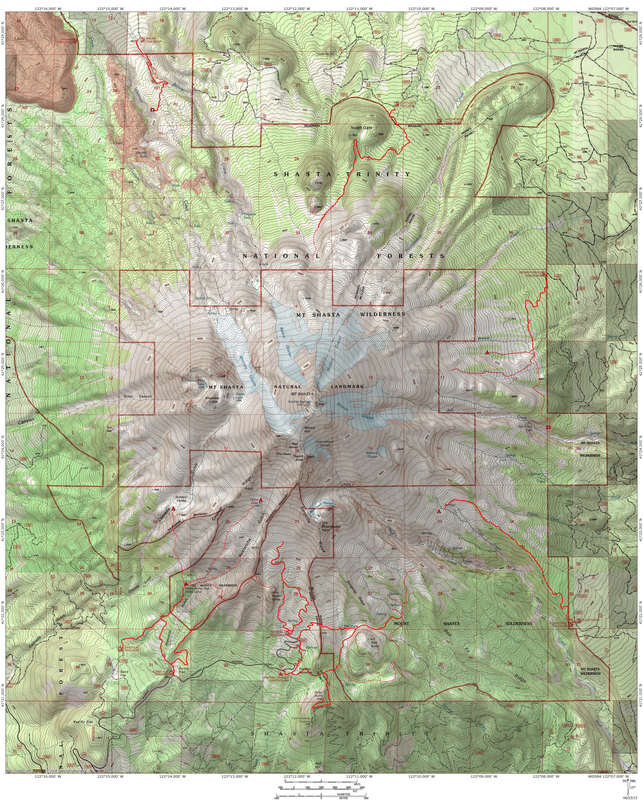 Far below, Lake Shastina, the Haystack, Yellow Butte and Grass Lake can all be observed. Mount Shasta glows above the approach to the North Gate trailhead. From Interstate 5, drive east on Highway 97 for 14.8 miles. Turn right onto Military Pass Road. Proceed along this dirt road for 4.5 miles to the junction with Andesite Logging Road. There are signs indicating the North Gate Trailhead at this point. Turn right onto Andesite Logging Road anf follow the signs to the trailhead for almost four more miles. The road gets rougher as one nears the trailhead. Low clearance vehicles are not recommended on this section of the road. There are numerous junctions en route to the trialhead once one turns off of Military Pass Road but the signs are well situated and will successfully guide drivers to the trailhead. One of the gnarliest 4 miles of road around. I would advise you leave your “low clearance vehicle” at home. Agreed. I cleaned it up. 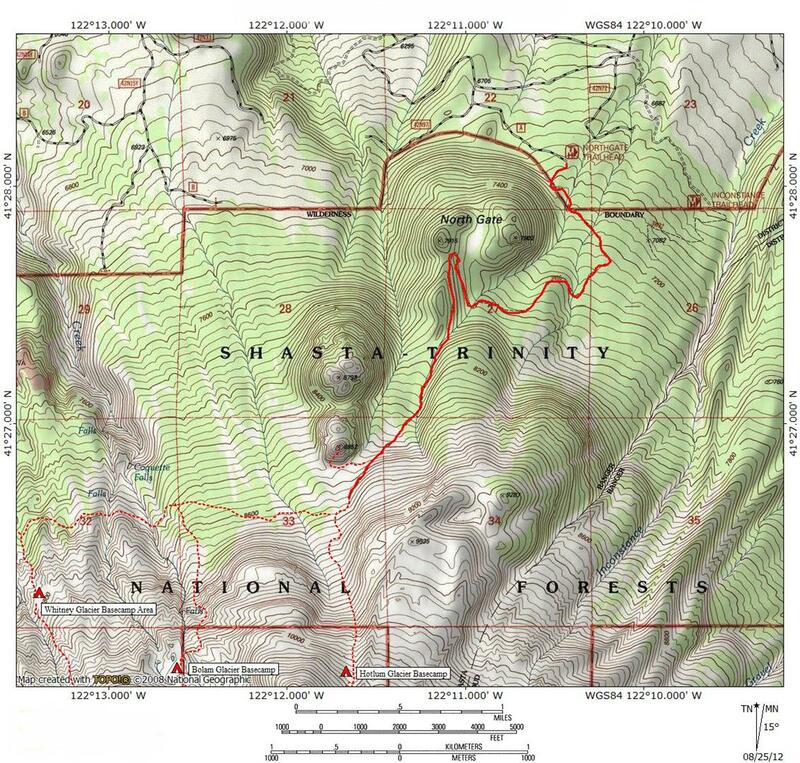 I’m thinking of spending a few days hiking around Shasta and then doing a summit attempt from the North Gate trail. I don’t have a vehicle (would be arriving by train to Dunsmuir, then hiking/hitchhiking to Mt. Shasta town my first day. Wondering how long it would take to hike around the base of the mtn from the south side to north? Day hike to the northgate plugs. This road from 97 to the northgate TH is terrible. No other words to describe it. Like driving in a dry river bed. The hike itself is moderate and pleasant. There is quite a bit of washout damage here and there. Come on USFS, you need to do some minimal road maintenance. This mountain is a major attraction and supports the economy of the area.